Start your Collection of Private Islands with this Miniature Private Island Figurine, exclusive to Vladi Private Islands! Vladi Private Islands presents an exclusive, decorative figurine inspired by the preciousness of private island ownership. 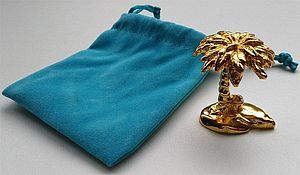 Depicting the traditional private island dream, the golden figurine features a leafy palm tree and a rustic island home atop a paradisiacal tropical island. Great as a gift or collectible, this unique creation makes an ideal present for all the island-lovers in your life. Presented with turquoise gift bag..